UTP Cabling can be installed in many ways, under floors or above ceilings in cable trays, inside conduit, in J-hooks attached to walls or roof supports, inside walls, even inside special cable trays in modular furniture. Installations need to be tailored to the property being cabled, the equipment being connected and local building codes, making generalizations about installations difficult. For all installations, however, certain cautions apply. Mistakes in installation of UTP cable can be detrimental to cabling performance and very difficult to detect. A mistake that could keep the entire system from working might not show up at all until the system is completely installed and turned on. Proper installation depends on proper design. The facility in which cabling is being installed should be designed according to industry standards which include all the pathways and spaces in which cabing and equipment will be installed. 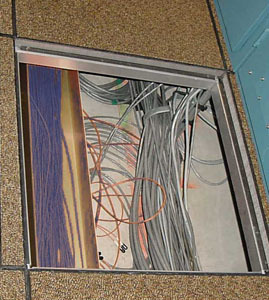 Even where the cables are routed in the building is important. Cables should be kept dry and in moderate temperatures. Above the ceiling in some buildings in hot climates can get very hot, causing UTP cable to have higher attenuation so it will not support full standard link distances. Supports for the cables should be wide enough to support the cables without distortion, spaced closs enough so the weight of cable supported (copper cable bundles are heavy!) and have no sharp edges to cut or kink the cables. The performance of the cabling network is also heavily dependent on the installation. The components used in structured cabling installation have been carefully designed and exhaustively tested to meet or exceed the requirements of EIA/TIA 568 for performance at 100-250 MHz. If the cable is not properly installed, performance will be degraded. Just like we keep reminding about maintaining the pair twists right down to the terminations, there are other things you must realize to maintain the performance of Cat 5e/6/6a UTP cable! First of all, pulling tension must be less than 25 pounds. That's not very much tension! Pulling at higher tension can stretch the cable and affect the twists in the pairs, and it's those twists that make the cable perform well at high frequencies. 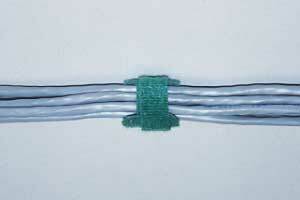 Puling cable in conduit is especially critical as you must deal with friction in the conduit and pulling around bends. Installing breakout boxes for intermediate pulls is often necessary and one may need to use pulling lubricants in the conduit. 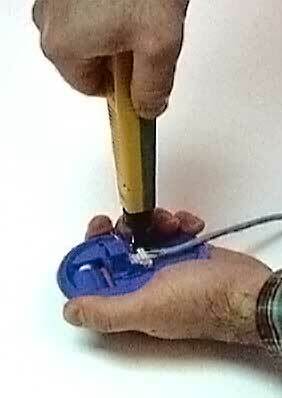 (Just be sure to use an appropriate lubricant to prevent long term degradation of the cable.) Likewise, kinking the cable by letting it get twisted or pulled around sharp corners can cause permanent damage. Damaged cable will probably not pass crosstalk tests. One should also avoid bundling the cables too tightly. Crushing the cables can affect the performance, since it can affect the twist and pair alignment in the cable which affects high frequency performance. If one uses regular plastic cable ties, they should be tightened only finger tight and cut off - do not use cable tie guns which may tighten tight enough to damage the cables. Preferably use "hook and loop" cable ties (shown above) which have an added advantage that they can easily be opened to add or remove cables. 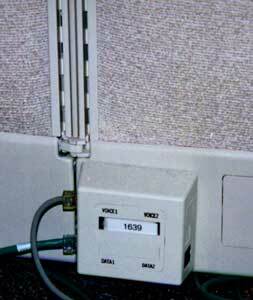 Most cable boxes are designed to allow easy pulling directly from the box. Gather up several boxes and pull a bunch of cables at once. Tape them together and attach a pullstring or just feed them along by hand. You can pull from the telecom closet or to the closet, whichever is more convenient in the install you are doing. You can also pull to consolidation points then out to individual outlets or vice versa, instead of pulling the bundle of cables all the way. 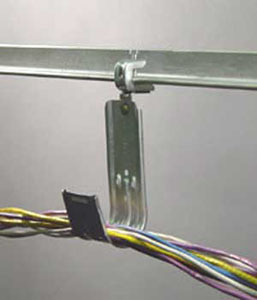 Riser installations are more easily done by dropping cables down rather than pulling up. Riser installations need to be secured at regular intervals to prevent the weight of the cables suspended from causing long term problems. One item to remember is there is usually 1,000 feet (about 300 meters) of cable in each box. Each cable is also marked with a distance every few feet so you can keep track of length by reading the distance off the cable. 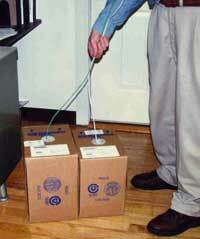 Before you pull any cable from the box, find the distance marked on the cable and write it down on top of the box! That way, you can calculate the length of each cable you pull and more importantly, the amount remaining in the box! It's not good to start pulling a cable and find out it's not long enough! Likewise, mark every cable with a location it's going to. Mark it on both ends! You will save lots of time making the correct connections, recording test data and keeping records for moves and changes. A fine tip permanent marker will mark the cable neatly. UTP cable should be installed on special hooks, bridle rings or cable trays that limit its bend radius and stress to preserve the performance. 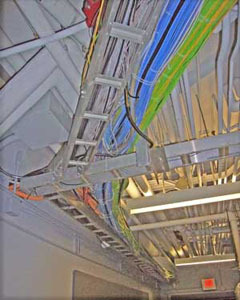 You cannot lay the cable on top of ceilings or hang from the drop ceiling hangers - in most places it's against code! Penetrations of firewalls always require firestopping to restore fire retardancy. You also have to keep the wire away from sources of electrical interference, like fluorescent lights and power cables. And, of course, we'll remind you again that twists on the pairs must be kept within 1/2 inch (13mm) to maintain the crosstalk performance of the cable through the terminations. Power cables are also a safety hazard. 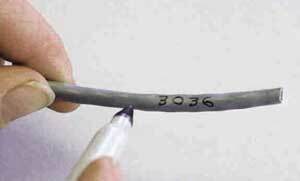 Although this cable is called "low voltage," it runs in areas full of power cables that can be a shock hazard. If you are not familiar with electrical safety, fire safety and inspections, I strongly suggest taking a course on the NEC (National Electric Code in the US, CEC in Canada and similar codes in other countries) to learn about these important topics. It could save your life! And when premises cabling systems are installed, they may be inspected by local building or electrical inspectors for proper installation according to the NEC. -Hard hat, safety glasses, appropriate gloves and steel toe shoes are recommended. -Observe ladder safety rules - many installations require work above ceilings. Electrical inspectors do not always inspect communications wiring. Nonetheless, take a moment to check with local electrical inspectors before you do any work in their jurisdictions. In most cases, the inspector of your installation will be the same person who signs you contract, although in some cases, the inspector will be a third party. Make sure you know who will inspect your work before you give your customer a final price. You must know what the inspector will expect of you and what he or she will be looking for. On riser installations (overhead installation), try to lower the cable down, not pull up and secure carefully at recommended intervals. Cable ties must not be so tight as to distort the jacket of the cable. They are only used to prevent unnecessary movement of the cable, so snug is tight enough. Carefully follow all codes and firestop all penetrations.